Solo eating establishments—the truly great ones—require a precise atmosphere. Some are quiet and discreet. Others are unexpected and lie in plain sight. But they can all be difficult to find in a metropolis. Alex Vadukul presents a new one here on the first week of every month. 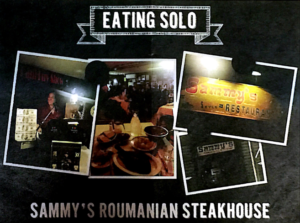 The second in the “Eating Solo” series: Sammy’s Roumanian Steakhouse, an offbeat, fluorescent-lit Jewish chop shop in the Bowery that The New York Times once referred to as the “most wonderful terrible” restaurant in town. Eating alone is the antithesis of Sammy’s Roumanian Steakhouse, the offbeat, fluorescent-lit Jewish chop shop in the Bowery that the New York Times has referred to as the “most wonderful terrible” restaurant in town, but that’s also what makes it a perfect place to eat at solo. Eating without others at Sammy’s puts you in the minority—I’m told there are only a handful of such eaters per week. People have been coming to Sammy’s since 1975, expressly to feast in groups. That’s almost the point of this nonstop bar mitzvah for adults, located down a set of steps on Chrystie Street. Much like the restaurant’s singing, keyboard-playing musician, loaded with his array of rehearsed self-deprecating jokes, Sammy’s has its signature repertoire of crowd-pleasing tricks: the pitchers of schmaltz (chicken fat) that are held high to dribble down the yellow viscous liquid into bowls of chopped liver, the seltzer chargers, do-it-yourself egg creams, and vodka bottles served in freezing blocks of ice to assist not only with inebriation, but to pacify any alarming pangs that may grip your heart after the gluttony of liver. The food has much merit—the garlic-smeared steaks and broiled sweetbreads should satisfy any carnivore—but the restaurant’s richest offering is its unique atmosphere, which becomes so zany and mayhem-filled that solo eaters can enjoy the rare privilege of becoming invisible altogether: a table alone at Sammy’s becomes your own private island of crisp vodka shots and gut-busting food alongside some of the finest people-watching around. The spectacle works well in part because of Dani Luv, the restaurant’s primary in-house musician and entertainer, who plays nightly sets of ribald and Yiddish-inflected joke tunes on his keyboard, bringing crowds to laughter, inhibition, and foot-stomping “Hava Nagila”-singing dance circles. His tunes include “Brown Eyed Jew,” “Girl from Emphysema,” and “Hey Jew.” One recent night he complimented a dancing couple. “Ladies and gentlemen, give them a nice round of applause: the beauty and the beast.” “Welcome to Sammy’s, the house of cholesterol,” is another common Luv line. Take in Sammy’s like a movie when you go alone. You’ll stand out at first but gradually disappear into the scene. Observe the buttoned-up man, emboldened by vodka, glancing to see if waiters are watching before grabbing a bottle from a now-empty table to pour a round of shots for his friends. Or the older lady who gets in on the dance circle only to fall down and get back again. Enjoy privilege of fading into an establishment that can bring out some of the most colorful aspects in people.